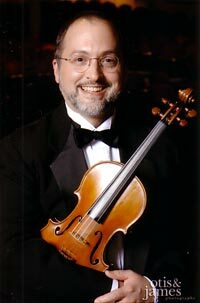 Dr. Jon Rumney, Professor of Music at Minot State University (ND) since 1994, teaches violin, viola, chamber music, and music history. He is Concertmaster of the Minot Symphony Orchestra, and has frequently been a featured soloist with that ensemble as well as with the Missouri Valley Chamber Orchestra (Bismarck, ND). He was Artistic Director of Dakota Chamber Music from its inception in 1996 to 2005; DCM is a nationally recognized summer institute for strings and piano, and winner of the North Dakota String Teachers Association Distinguished Service Award (2003). He received his bachelor, master, and doctor of musical arts degrees from the Eastman School of Music (Rochester, NY). He has studied chamber music with members of the Juilliard, Guarneri, Cleveland, Emerson, Tokyo, and American String Quartets. Dr. Rumney’s students have won numerous awards, including first prizes at state American String Teachers Association Solo competitions, and fellowships to summer programs such as the Blossom Music Festival (OH), the National Orchestral Institute (MD), the Brevard Music Festival (NC), and the American Institute of Musical Studies (Graz, Austria). His former students have found teaching positions nationwide, and some have continued their studies at schools such as Juilliard, Eastman, the Cleveland Institute and the Cincinnati College Conservatory.